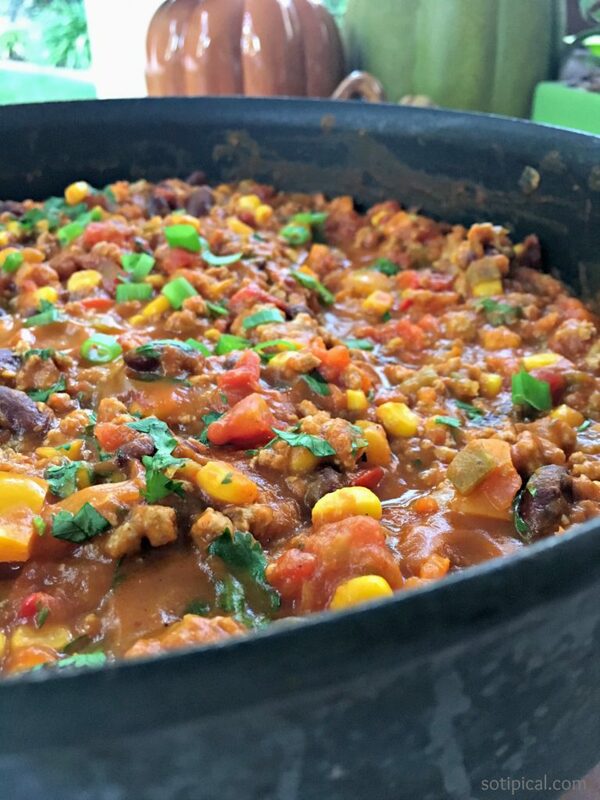 I’m always looking to try a new chili recipe but this Pumpkin Chili is the one my family will always choose over the rest! I mostly refer to it as their “favorite chili” because when they were younger, I once used the word “pumpkin” and the kids wouldn’t eat it, even though Pumpkin Chili was already their favorite! (Insert eye roll here!) This has been our traditional Halloween night dinner as long as I can remember. Whether we have it with hot corn bread or over rice, we LOVE it! We’ve even mixed elbow noodles in it for a chili-mac and that was great too! 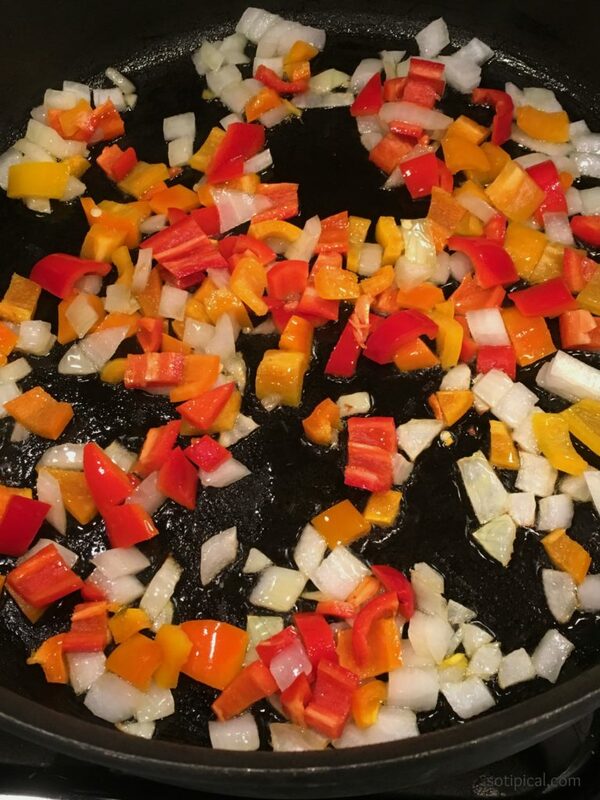 Heat oil in a large skillet. When hot, add onion and pepper. Cook until veggies start to become tender. 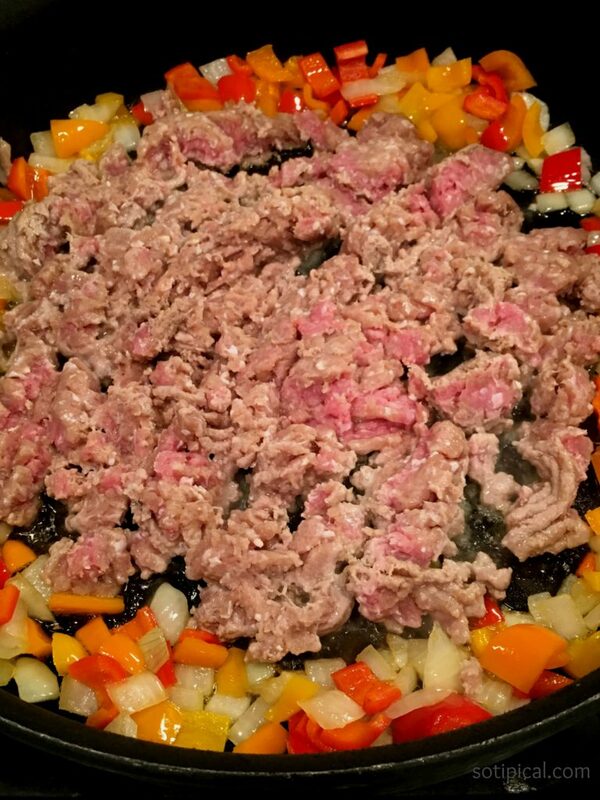 Push to outer portion of skillet and add ground turkey to the center. Brown the turkey until fully cooked, then drain. 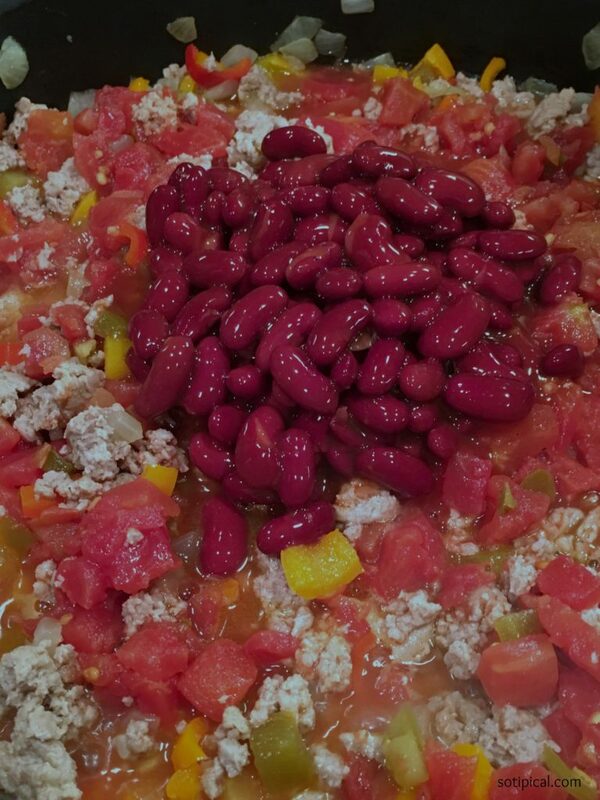 Next add the 2 cans of tomatoes and chili beans. Once pumpkin puree is well blended, then add your salsa and corn. Mix in taco seasoning, then simmer on low for about 20-30 minutes. This really is one of our favorite recipes! Here is a tip for make ahead meal prep! I often buy large bulk packages of ground beef or turkey. When I get home, I pre-cook all of it and freeze 1 lb portions in quart sized freezer bags. This makes it so easy to get dinner on the table on a busy night. You can easily pull out a pound of the turkey and add all the other ingredients to your slow cooker! Within about 3 hours on high or 5-6 hours on low, you can easily make this for dinner, even on a busy weeknight! Prep it before you pick the kids up from school and it should be done by dinnertime! 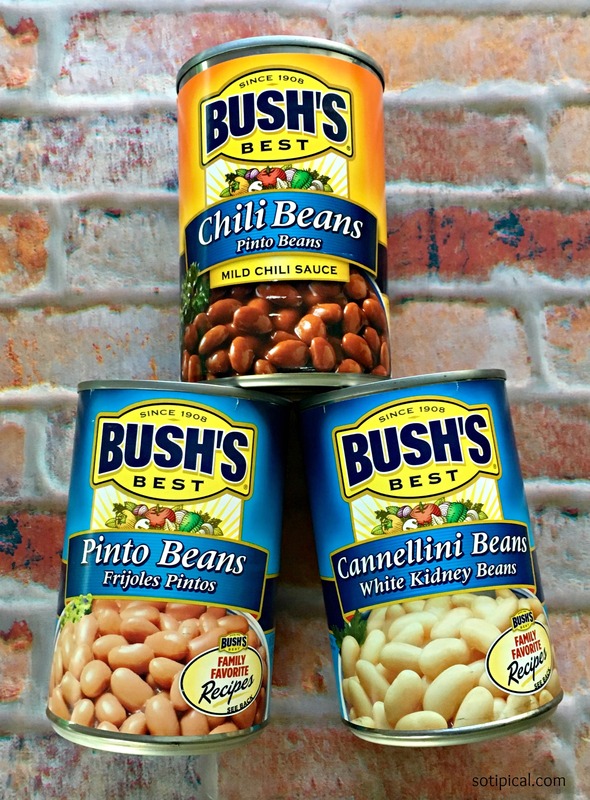 BUSH’S® Best Beans are a pantry staple that I always have on hand for a last minute meal. Same goes for the precooked meat I keep in the freezer! 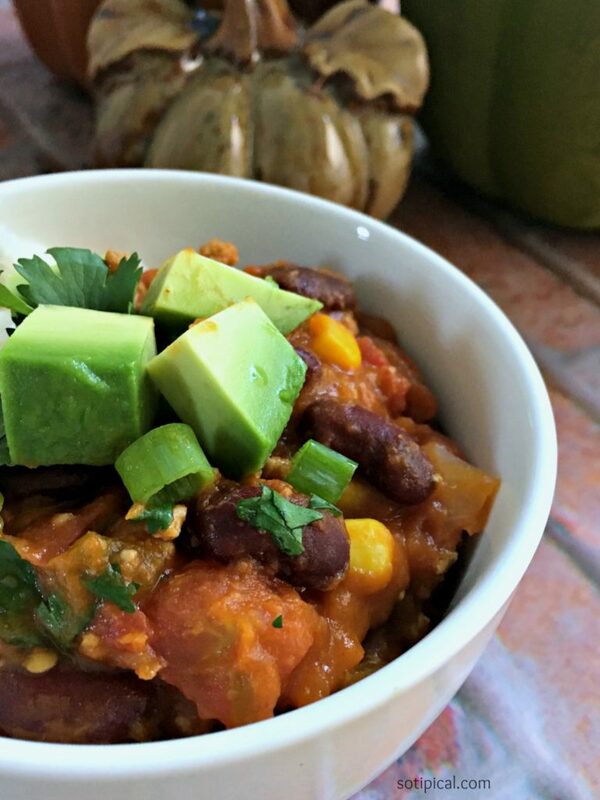 In a short time, you can serve your family a healthy meal like this Pumpkin Chili packed with protein and fiber. Other easy ideas would be nachos, enchiladas, taco salad, burrito bowls and more! Such a great time saver and a great value too! Go stock up! You’ll be so glad you did! yes yes yes!!! 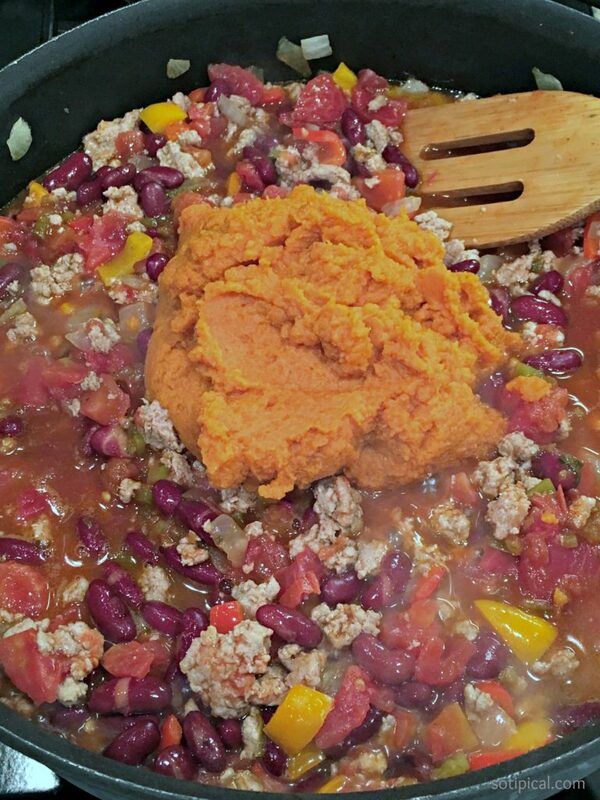 This sounds absolutely delicious, I will definitely have to make this… I LOVE pumpkin and chili. Thanks for sharing! I always make chili for Halloween night, but I’ve never thought about adding pumpkin to my chili. I can’t wait to give it a try in a few weeks! Thanks for the recipe. this looks SO good! 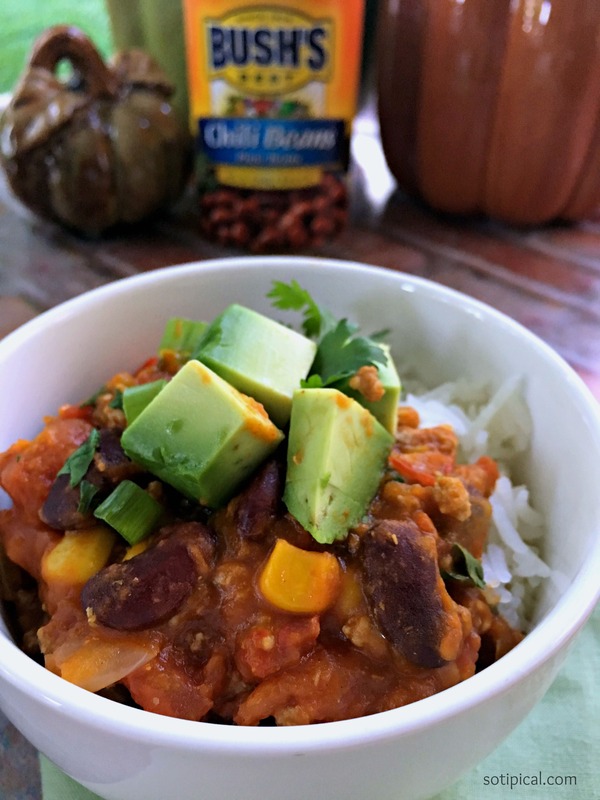 I love pumpkin and chili, the perfect combo especially for a chilly fall day!! bookmarking this to make later! I’m not generally a fan of canned food but you have worked magic. You would NEVER know any of that came from a can. Looks delicious. Perfect for the upcoming fall season! I love your photos too, they show every step super clearly! I love cooking with pumpkin! It adds a little bit of fall into every bite! This sounds so yummy. I am super intrigued – I LOVE chili and have never had pumpkin in it. Your images are beautiful! Definitely pinning! I have never had pumpkin chili, but I keep seeing it, and I think we definitely need to make it sometime! I would have never thought in a million years to put pumpkin in chili, but it makes sense. I wonder if that would work as a vegan chili too – just substituting the meat for the vegan meat crumbles, That sounds pretty awesome actually. Blessings! A coworker of mine made this for a potluck and I was blown away by it. I absolutely loved the flavor. I didn’t realize the recipe would be so easy. Thank you for sharing. Adding to my fall and winter line up. I think I could get away with making this as a crockpot dinner.